It’s been a very busy and productive three years. Since last you heard from me, I moved from New Jersey (yes, I am a Jersey girl…as the saying goes, you can take the girl out of jersey but you can’t take the jersey out of the girl). I was born and raised 12 miles outside of Manhattan, so I have the absolute joy of traipsing into the Big Apple to enjoy the plethora of wonderful vegan dining options. In 2006, I moved to South Jersey, only several miles from the Ben Franklin Bridge, which takes you straight into Philadelphia, also known as one of the best vegan cities in the U.S. But alas, it was time for a change. On September 1, 2015, I shifted gears, went into semi-retirement after 28 years of working as the key administrator in the addiction treatment field. I took a leap and moved to the Sedona, Arizona area. As part of my pre-planning, I started the Meetup Group, Verde Valley Vegans in 2013. We are an active and fun group, doing such things as potlucks, dining out, hiking, rafting, movie-going, and vegan outreach. 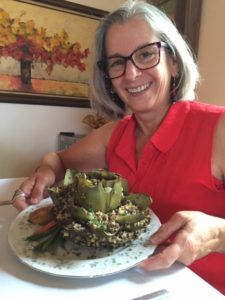 I’ve been cooking up a storm and creating many new vegan recipes, which is an utter delight for me. I have also started doing educational presentations and cooking demonstrations extolling the virtues of living a vegan lifestyle. To assist me in this regard, I graduated the Main Street Vegan Academy (thanks, Victoria Moran) and am now a Certified Vegan Lifestyle Coach and Educator. Since semi-retirement, I have started traveling, so I will be sharing my adventures, great and small with you and how it all relates to living a vegan lifestyle. Fun, right? I’d love to hear from you with thoughts, feedback, suggestions…but mostly as a way to create and expand our vegan community through sharing experiences (recipes and dining experiences included, because I can always talk food). So, look for me every week, on Tuesdays. Spread the word.